The World Senior Tennis Team Championships, held annually by the International Tennis Federation for players ages 35-55, will beplayed at Ali Bey Belek and Ali Bey Manavgat near Antalya, Turkey in April, 2007. The USTA selects four players per team from the USA based on their national play during the previous year. 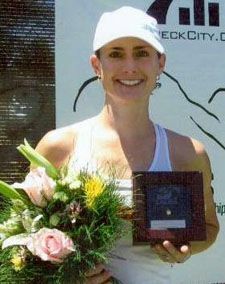 Jessica Schlotterback of Tempe, Arizona has been named to the Suzanne Lenglen Cup team for women 35 and over. Jessica is playing on the Lenglen Cup team for the second consecutive year. She placed second in the USTA National Claycourt Championships and the USTA National Grasscourt Championships. She finished 2006 ranked #2 in the nation. The USA Suzanne Lenglen Cup team finished second in 2006 on the hardcourts in South Africa.